I believe this. I believe that when one definitely commits to an enterprise, fate moves too, and all sorts of unforeseen things begin to happen. I’ve seen it happen in my own life. It took me a long time to definitely commit to a writing career. I hesitated, not because I had any hesitation about writing – I had wanted to write since I was twelve years old. But because I had all sorts of doubts about myself, about whether I would be good enough. There were times when I definitely thought I would not be – I mean, I thought I would be good enough for publication, and even to have a career, but that wasn’t good enough for me, if you see what I mean. Because I wanted to be great, to be one of the writers that people remember. Virginia Woolf with fairies. It took me a long time to believe I had that potential. (Not that I’m anywhere close to realizing it, of course. But I had to believe the potential was there.) Partly, it was other people telling me I had it that convinced me. (So thank you, Dan Simmons and Jim Kelly and everyone else who told me I could do it.) And partly I had to just put in the work, start to feel the power of it flowing through my hands. I can feel that now – I can feel the skill, the ability to put words together the way I want to, so they express what I want to. Like a dancer aware of her own body, aware that it can do what she needs it to so she can produce certain shapes, create certain patterns. Express what is in her. At some point, I did commit myself. And around that point, things started to happen. I was offered opportunities I would not have expected, to teach and edit, to write for certain publications. I was in the right places at the right times, with the right qualifications. And fate moved for me. 1. Commit to it, and announce your commitment to it. But the commitment has to be genuine. There can be no hesitancy. And show your commitment by working on it, whatever it is. If you can work on it every day, all the better. 2. But realize that commitment is magical. It’s like a spell. Don’t talk about how much you would like to go to Nepal (to use an example that came up recently in a conversation with a friend) unless you really want to go to Nepal, and intend to someday. Because fate will get confused and start wondering about your intentions. Do you really want to go to Nepal? Or do you want to go to England to research your first novel? Focus on what you actually intend, what you have committed to, and articulate that. 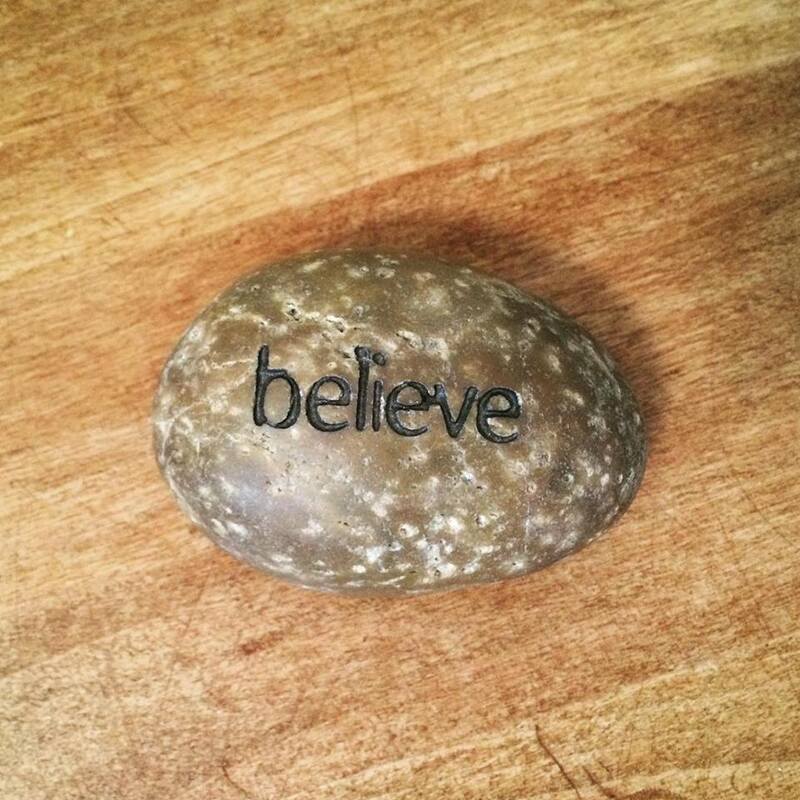 It’s a rock with the word BELIEVE carved into it. I bought it years ago, in some sort of gift shop. Sometimes I find myself playing with it, and I realize that the impulse is almost unconscious. It’s when I most need to BELIEVE that I reach for it. It’s a small spell, of sorts. I know there are people who will say, do not trust to fate. Put your trust in hard work. But if you believe that hard work alone will get you where you need to go in a career like writing, well – that in itself is wishful thinking. You’re going to need luck too, except I call luck fate, because it’s not random. It favors the prepared. In other words, the committed. “Virginia Woolf with fairies.” That’s the best description of your writing I’ve heard thus far. And I envy your experience with Dan Simmons. That was when I first took real note of Odyssey, and even sent an e-mail to Jeanne at the time pleading to sit in on one of his lectures—which, given Odyssey’s construct, wasn’t possible. Then, a few years later at Readercon, I heard you say how Odyssey had changed your life. And voila, here I am now, an alumna (alumni?). I’ve always loved the quote you start this entry with, but I’d seen it as attributed to Goethe. However, I suspect your research was a bit more thorough than mine. P.S. Will you be at Boskone this year? Jeff, I think you’re an alumnus! 🙂 According to that scholarly source, Wikipedia, it’s commonly attributed to Goethe but actually from Murray. And thanks, I do rather like the “Virginia Woolf with fairies” quotation but would hesitated to apply it to me only out of deep respect for Woolf! I’ve told the Boskone folks I will be there . . . This is one of my favorite quotes. I don’t understand how/why it works, but I have experienced this movement of fate as well. I’ve found it hard to describe without sounding like “The Secret”; I like that your discussion here avoids anything like that. I know, it does tend to sound all new-age-y, doesn’t it? And yet I firmly believe in it too. I think when we’re going in the right direction, the universe shifts around to help us . . . I think this is my favorite post of yours. I’ve bookmarked it for easy reference for when I need it. And I think it’s just something really nice to keep in mind, always. Just what I needed to read (especially your third point) at this time of my life. Thanks for this reminder!